Recovery is just beginning as California reels from the deadliest fire in history. Direct Relief is continuing response in Northern and Southern California. The deadliest and most destructive wildfire in California has now been contained, but residents of Butte County are just beginning to consider what recovery will look like for their communities. The Camp Fire broke out on November 8, killing at least 88 people and destroying most of the town of Paradise. With more than 200 people still missing, search and rescue efforts continue. In Southern California, the Woolsey Fire, which has also been contained, claimed three lives and destroyed 1,500 structures. The destruction of the fires was sweeping, and Direct Relief has been working in the weeks since to meet health needs in these devastated communities. How Has Direct Relief Responded So Far? Since the fires began, Direct Relief has been responding daily to emergency requests for assistance and has delivered 42 emergency shipments of medications, medical supplies, and other essentials to 21 health providers and response organizations in fire-affected areas. The rapid-response effort has thus far delivered more than 5.5 tons (11,253 lbs.) of specifically requested health essentials valued at $300,652 wholesale. Among the items delivered, typically within 24 hours of the request, have been 52,253 doses of medication, including insulin from Novo Nordisk, inhalers and other respiratory medications, medications for chronic diseases needed by evacuees, flu and tetanus vaccines, as well as essential supplies such as nebulizers to administer breathing therapy and oxygen concentrators. Special care has been taken care to preserve the quality of temperature-sensitive medications like insulin throughout the delivery process. Over Thanksgiving week, Direct Relief staff rushed deliveries to Butte County, where local shelters still housing thousands of displaced people were hit by outbreaks of highly contagious norovirus – which causes diarrhea, vomiting, nausea, and severe stomach pain – creating expanded health risks and adding misery. The team delivered requested prescription anti-nausea medications, and other anti-infectives, oral rehydration salts, and also personal protective gear and disinfectants for clinical staff and clean-up teams. In response to a request from the Butte County Health Department, which serves the community of Paradise, Direct Relief also delivered 10,000 protective coverall suits to protect both officials and residents as residents begin to be escorted to visit their properties and sift for belongings amidst the ashen remains of their homes. The Woolsey Fire destroyed 1,500 structures, including more than 100 homes in the Seminole Springs Mobile Home Park in Agoura Hills. 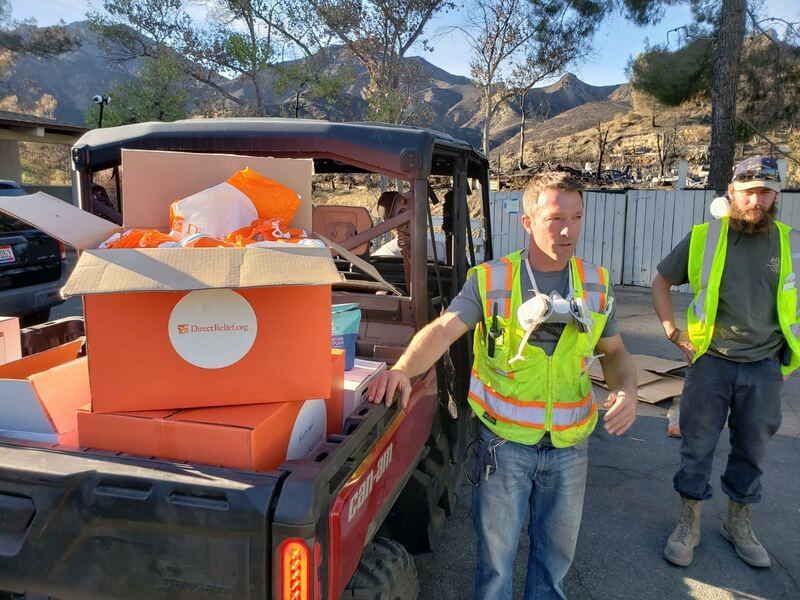 Volunteers from the Santa Barbara Bucket Brigade and the Upper Ojai Relief group gathered to help residents, many of whom are elderly, sift through the ashes to collect keepsakes and other items that could be found. On Monday, Direct Relief staff delivered protective gear for those doing search and recovery. Because wildfires can quickly degrade air quality and exacerbate respiratory conditions, more than 115,000 N-95 respiratory masks have been distributed across the state. More than a dozen of Direct Relief’s specialized Emergency Medical Packs have been shipped to first responders for triage and shelter care. Each ruggedized pack contains supplies and equipment to address common disaster-related health needs, including infection control, diagnostics, trauma care, and personal protection gear. Direct Relief initially developed, designed, and field tested the Emergency Medical Packs ten years ago, and the packs have since been awarded by the Office of U.S. Surgeon General and formally adopted as the standard within the State of California by the Emergency Medical Services Authority for Medical Reserve Corps members. More than 600 hygiene kits, with personal care products for displaced residents, as well as several Emergency Health Kits, packed with essential medicines and supplies, have also been shipped. With much of the housing stock in Paradise destroyed, local shelters may remain operational for months as residents decide how to rebuild their lives. Many local health providers are among those who lost their homes, too. More than a dozen staff at AMPLA Health Center, which operates several clinical sites near Paradise, lost their homes during the Camp Fire. Staff at the Feather River Hospital also lost homes. Direct Relief has issued emergency cash grants of $50,000 to each of the organizations for their emergency activities and for costs that won’t be reimbursed by insurance. Both groups have received multiple shipments of medical aid from Direct Relief as well. With the recovery process just beginning, Direct Relief remains committed to supporting the affected communities, local organizations and residents on the long road ahead.